Camera Ballistics is a unique software product that uses advanced algorithms and cutting-edge technology to determine if a photo was truly taken by a suspected camera or not. Photos contain more information than what you can see in the image. Camera Ballistics’ unique scientific algorithm goes deeper than just EXIF. It will identify if a photo was taken by a suspected camera device or not, giving you maximum data from photos and making Camera Ballistics an essential tool for every forensic investigator. Camera Ballistics is not based on metadata such as EXIF, but it uses mathematics to analyze the physics of the sensor. Due to small differences in size and material composition, each pixel behaves differently, involving effects such as Photo Response Nonuniformity making each sensor unique. We can simplify the principle to say that it identifies anomalies of every pixel and uses this information to create a description of the camera sensor – the sensor fingerprint. This is true even between devices of the same make and model. It’s these differences that allow you to generate a sensor fingerprint and link an image to the specific camera that created it. Camera Ballistics will compare the photos under investigation to the sensor fingerprint to determine if there is a match. The power of Camera Ballistics is further amplified by its sleek and intuitive interface that guides you through processing in just a few clicks. 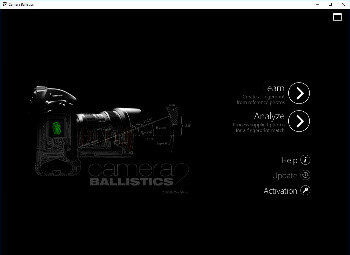 Camera Ballistics takes its complex analysis method and turns it into a two-phase process. Simply create a few reference photos with the suspect camera for the program to learn about the device’s sensor and a sensor fingerprint will be generated. Camera Ballistics will use this fingerprint to analyze the photos you are investigating and match it to the ones taken by the suspected camera. In this first step, you will supply reference photos from a camera in order to create its sensor fingerprint. The more photos you supply, the more precise your results will be. It is recommended to take at least 30 photos of white walls or clouds – images without sharp shapes and edges. Camera Ballistics will apply advanced algorithms to this folder in order to establish the sensor fingerprint. The second step will match the fingerprint file created by the learn process to the photos under investigation. When you run the analysis, you can see the processing progress followed by the mathematical data and results as after analysis. Finally, a comprehensive and well-organized PDF report suitable for submission as evidence is generated. The report contains clickable thumbnails of all processed images, the camera device make and model, GPS data, camera settings, mean square error, fingerprint presence result, match probability and correlation. Results should be interpreted like other typical ballistics tests: if traces of the device fingerprints are found, then there is an extremely high probability that a photo comes from the camera. If not found, it doesn’t necessarily mean that the particular camera has not been used to capture the image. This may happen when photos are resized too much or edited so the fingerprint information is damaged or lost. Imagine another scenario – an explicit photo of a high school student has gone viral between classmates. The victim tells the investigator who it was that took the picture, but the suspect denies it. The investigator can quickly determine if the suspect’s phone was used to take the picture or not. Or, when an alibi is in question Camera Ballistics can also be used to solidify or disprove a suspect’s whereabouts if a photo is provided as ‘proof’. The suspect says they were at a certain location and can prove it with photos. With our photo verification tool, an investigator can determine if the camera took the photos, when they were taken and use GPS data to pinpoint location.